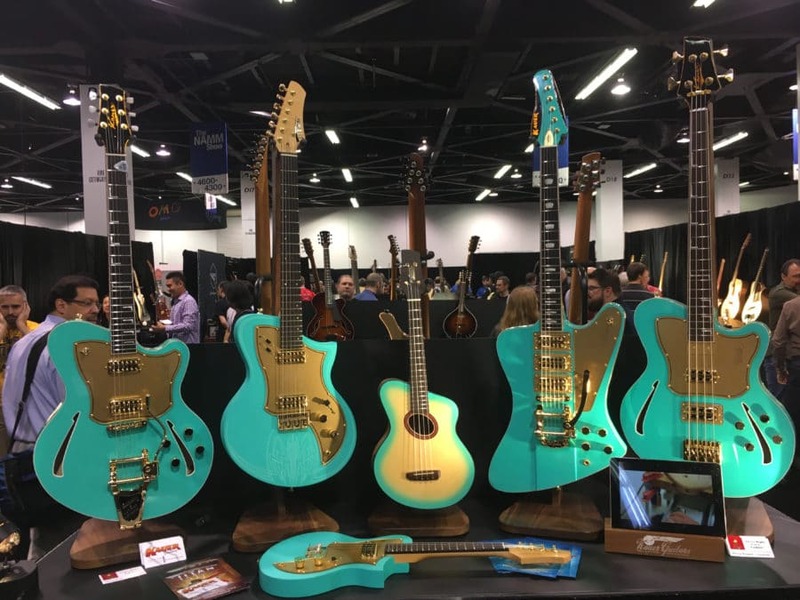 NAMM (National Association of Music Merchants) showcases instruments from boutique builders as well as the major manufacturers. 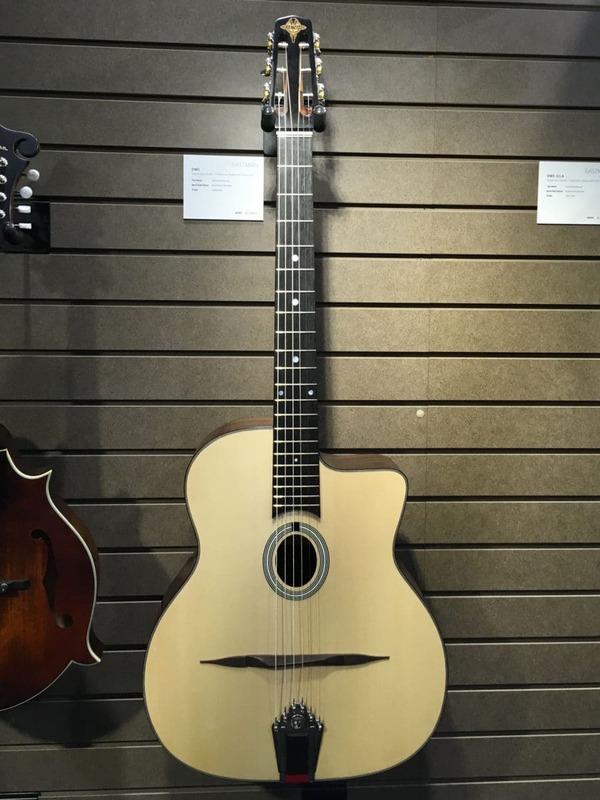 Here is an eye-catching display from Kauer Guitars. All photos (except last two) by Jake Kelly. 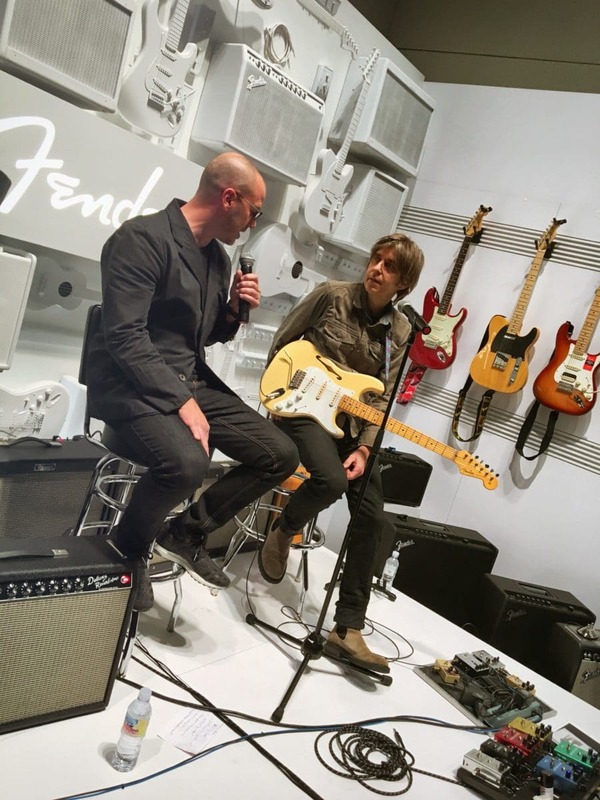 “Relicing” or making a new instrument look road worn isn’t limited to electric guitars. 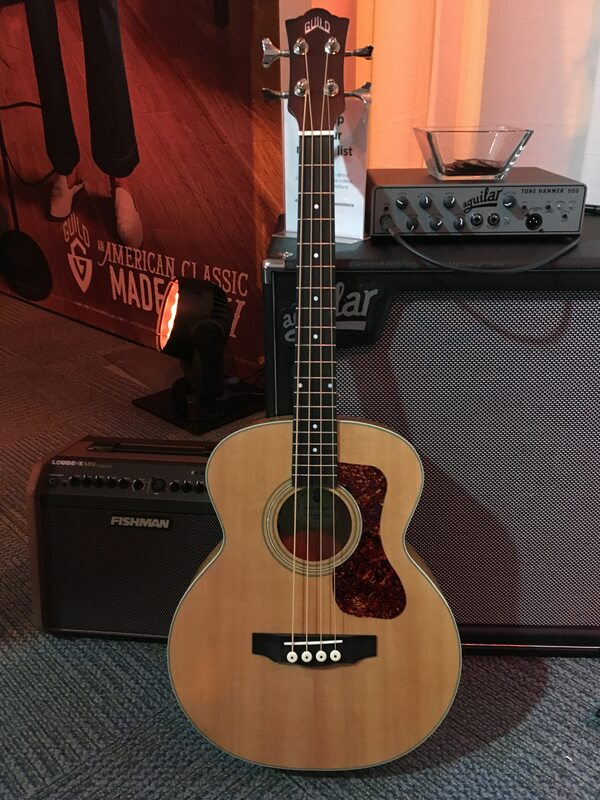 The Martin 000-15M Streetmaster looks as if it has years of mojo on it. 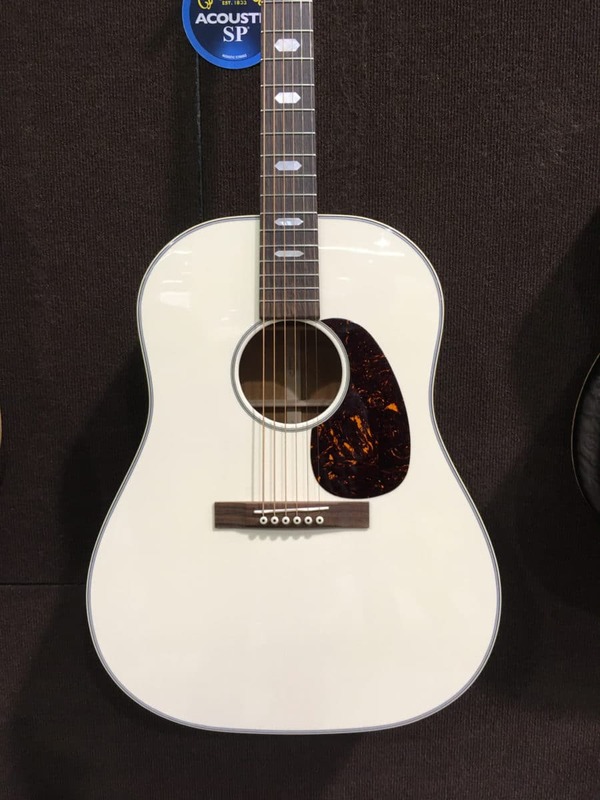 NAMM is also a place where manufacturers can show off some of the custom instruments that customers can order, such as this striking white custom Martin. 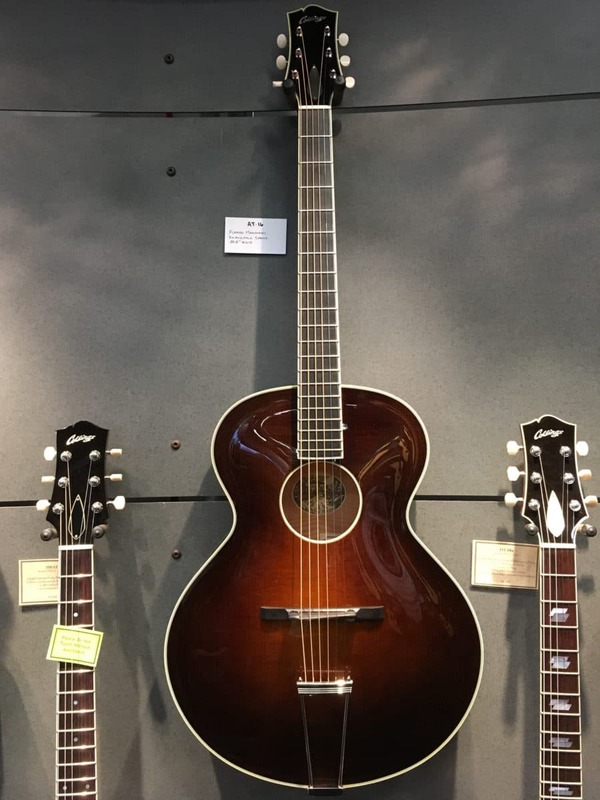 Eastwood Guitars added a gypsy jazz guitar, the DM1, to their impressive line of jazz hollowbodies, acoustic guitars, and mandolins. 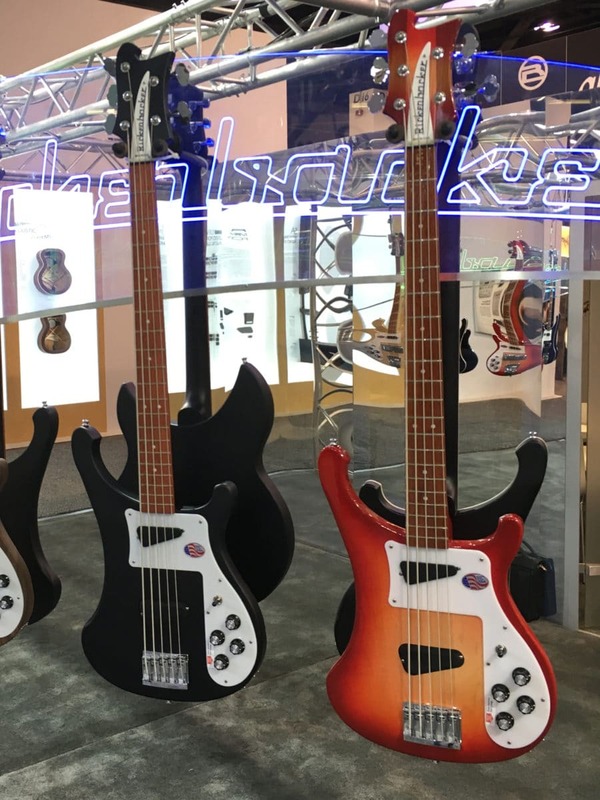 Rickenbacker introduced the 4003s/5: the company’s first 5-string bass. 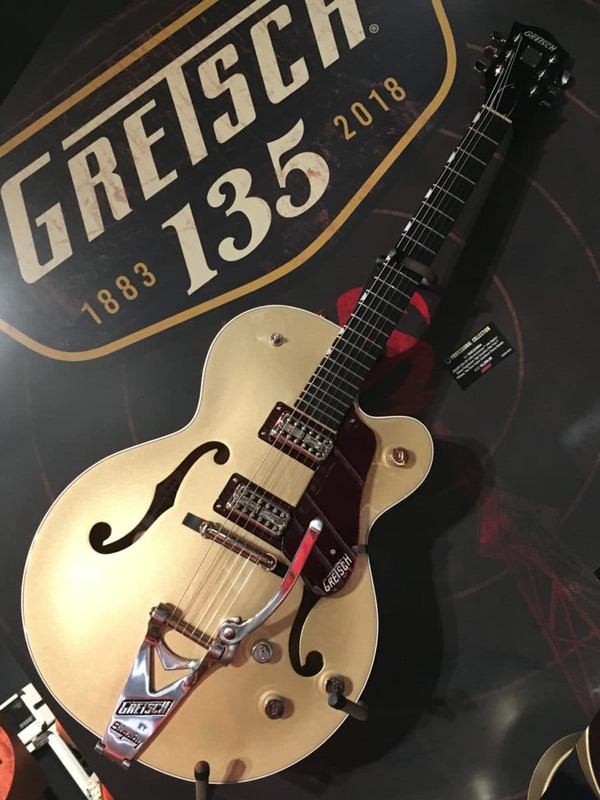 To commemorate their 135th anniversary, Gretsch introduced the G6118T-135 LTD Anniversary model guitar. This guitar features a two-tone metallic finish with a gold top and dark cherry back and sides. 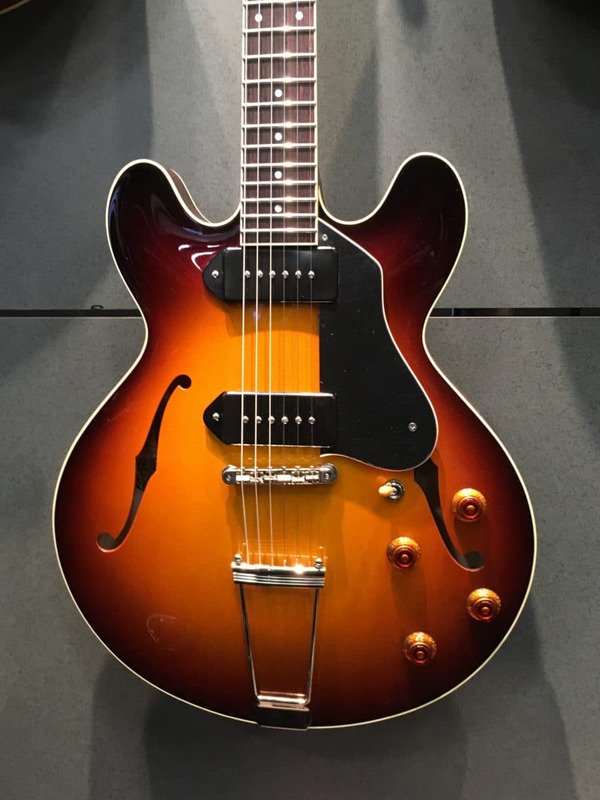 D’Angelico, a company best known for their hollowbody jazz guitars of their namesake founder, debuted a line of solidbody electric guitars. 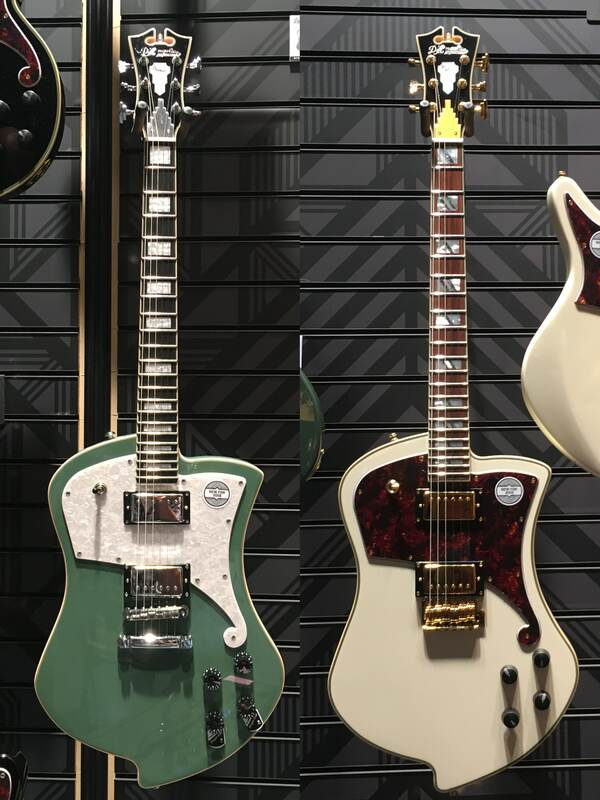 The line has a pair of traditionally shaped guitars in addition to the less conventional Ludlow models shown here. 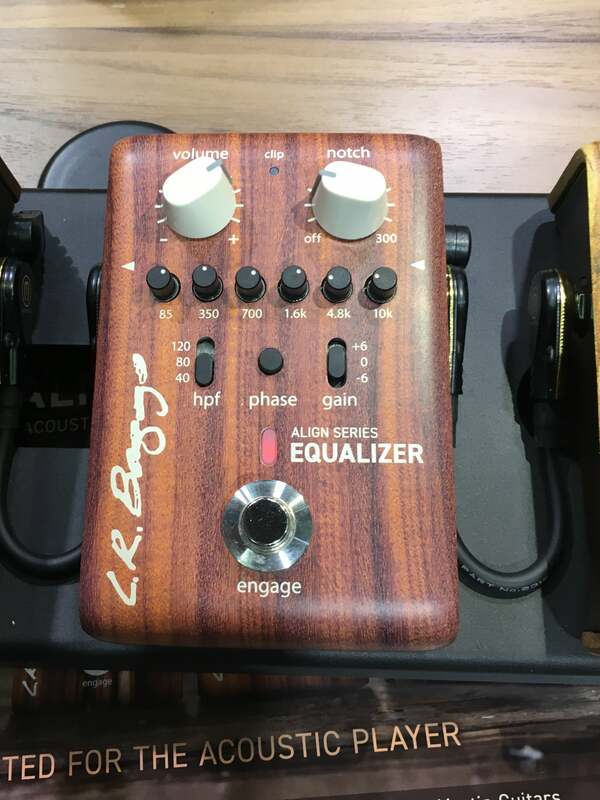 LR Baggs displayed the Align Series of pedals in their exotic hardwood casing. The line includes a reverb pedal, a D.I., a EQ pedal, and the Session pedal. The Session provides studio-style analog saturation for warmth and 3-band compression for clarity. This Recording King Century 33 uses pearloid for the fingerboard instead of the more conventional rosewood to create an intriguing visual effect. 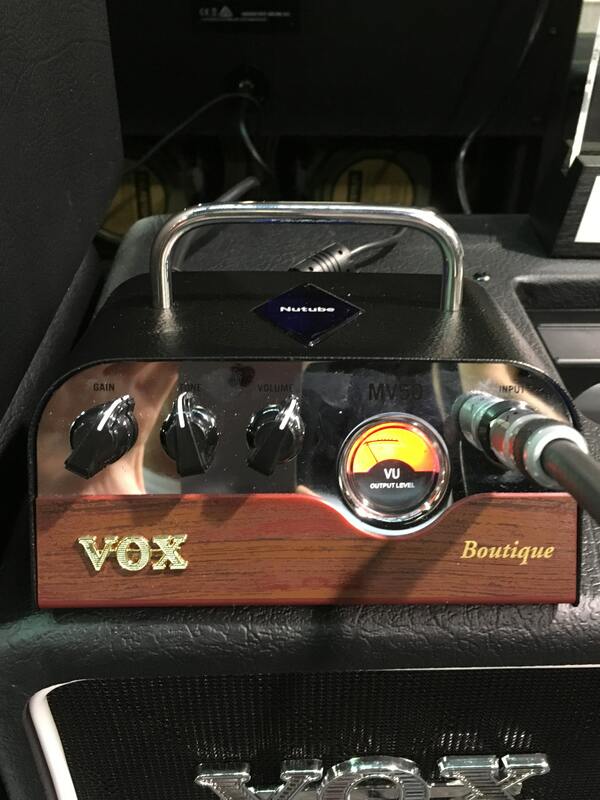 Vox introduced the MV50 series of compact amp heads in five different flavors: Clean, AC, Rock, High Gain, and Boutique. Each is a 50 watt hybrid with a class D power section and a preamp that uses a micro tube (Nutube) for actual tube response and coloring. Guild’s Jumbo Junior Bass has a short 23.75” scale length, yet is tuned to the same pitch as a conventional bass guitar. It comes equipped with electronics. 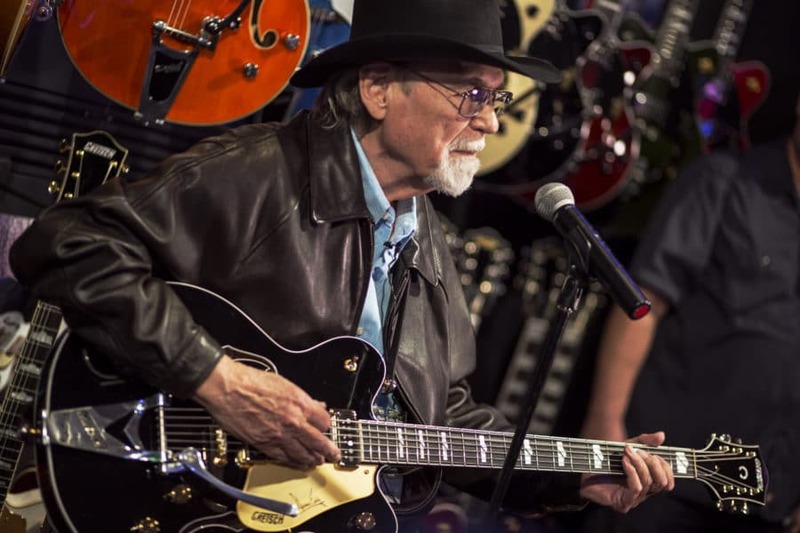 Pete Anderson demoed the 10th Anniversary edition of his Reverend signature model PA1. 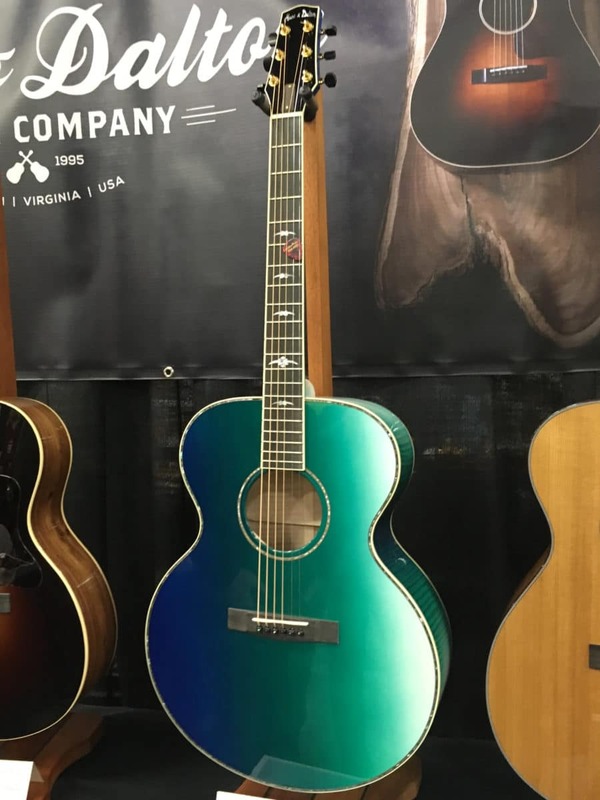 The surprise is on the inside: Taylor introduced an entire line of guitars with their new (and actually, revolutionary) V-class bracing system. 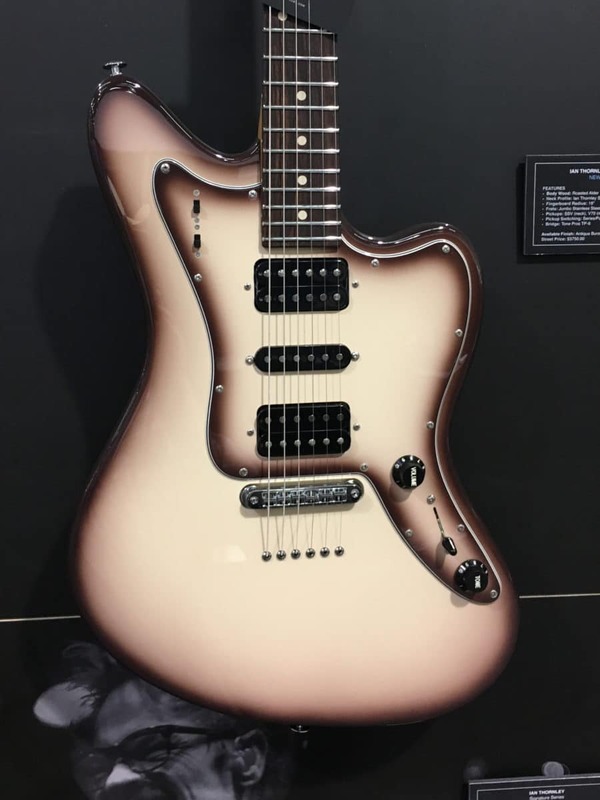 Taylor claims this new bracing increases the guitar’s volume and sustain by allowing the top to vibrate in a different way than one braced with the traditional X bracing. 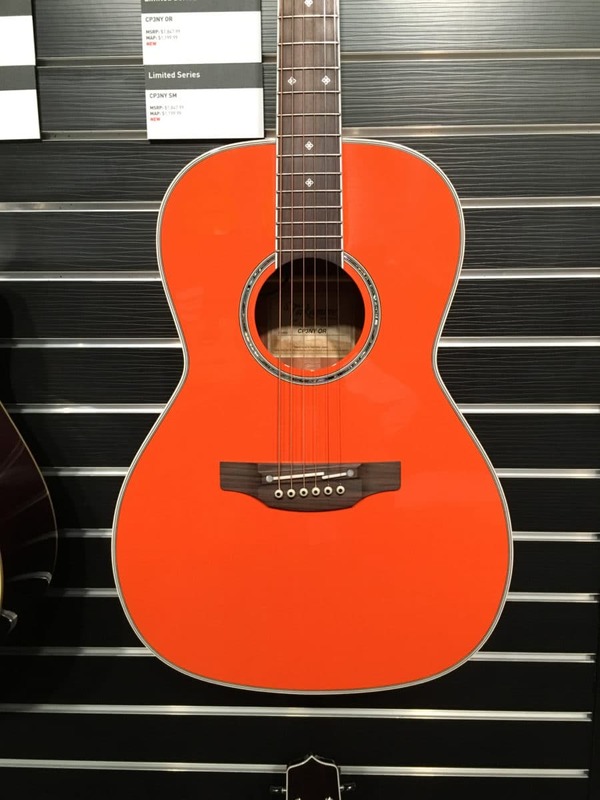 This sweet little Takamine CP3NY OR has a bold color was inspired by the Chet Atkins guitars of the 50’s and 60’s. The new Collings I-30 model features trestle bracing to keep feedback at bay while maintaining the signature thinline/hollowbody tone. Collings may be better known for their flat top acoustics and mandolins, but they also make carved-top guitars. This AT-16 has a round sound hole in place of the F holes the regularly used on this model. 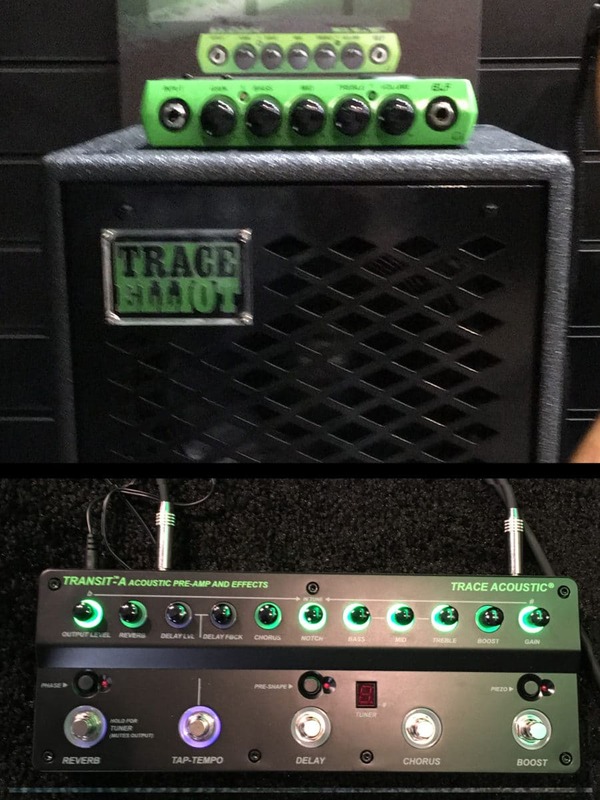 The Trace Elliot 2-pound Elf amp is can be used as is, or with the Transit-A acoustic preamp/effects pedal for additional coloring. There is also a Transit-B pedal for bassists. 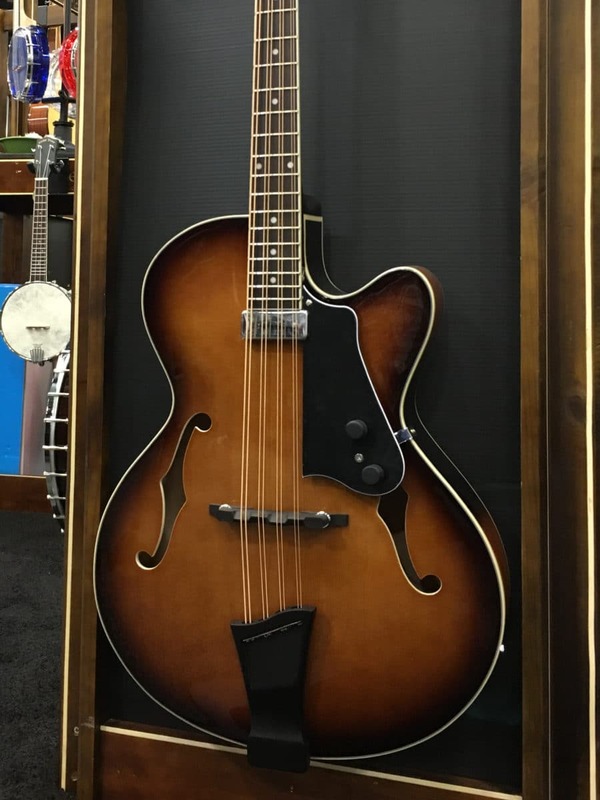 This Santa Cruz Custom FTC Model has a carved maple back (see inset) giving this flattop guitar the projection more often associated with a archtop hollowbody. 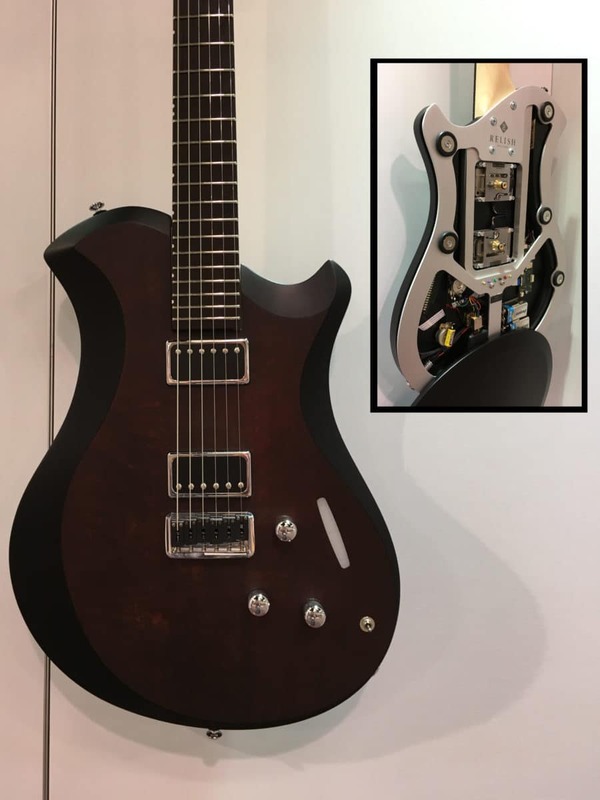 Relish Guitars from Switzerland have an innovative construction that allows pickups to be swapped out in seconds without the need of a soldering iron. This guitar also features a touch panel for selecting or blending of the pickups. 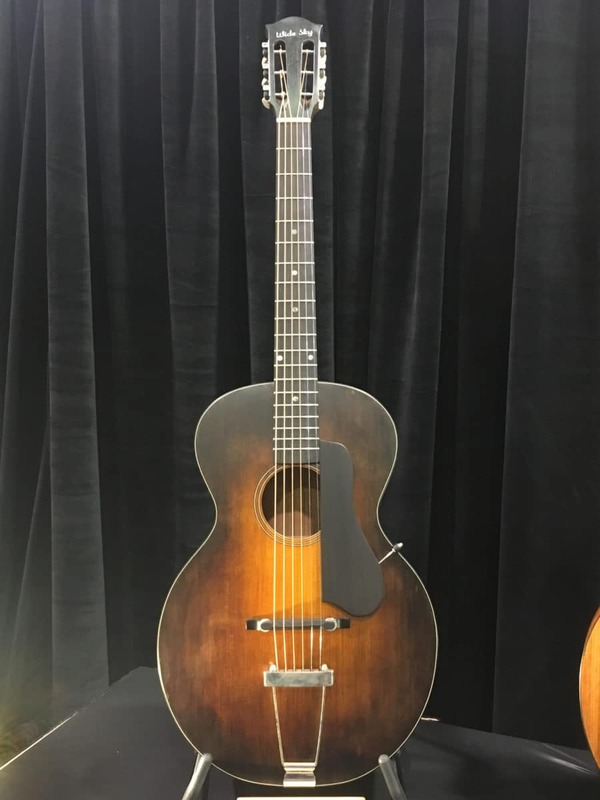 This beautiful PL1 archtop guitar from boutique builder Wide Sky Guitars out of New Mexico is clearly inspired by the Gibson guitars of the early part of the last century. The Antiqua Burst finish on this Ian Thornley signature model is merely one of the incredible finishes seen at the Suhr Guitar booth. 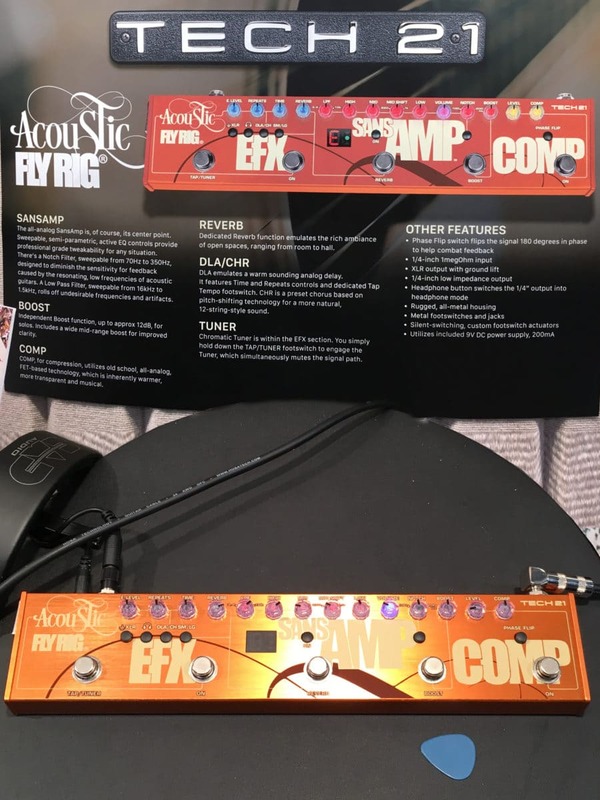 The Tech 21 Acoustic Fly Rig is a compact unit that gives the guitarist the most popular acoustic guitar effects with a boost switch, tuner and D.I. 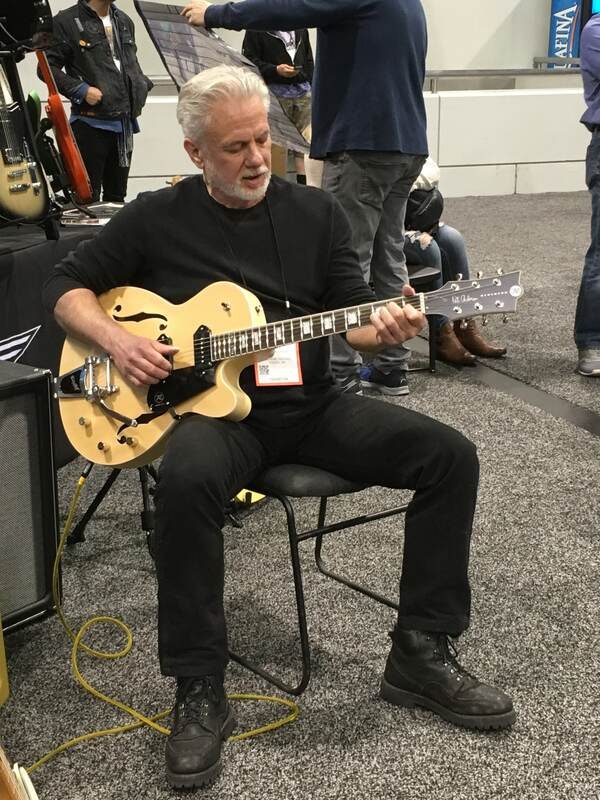 One of the best parts about attending NAMM is being able to see instruments created especially for the show. 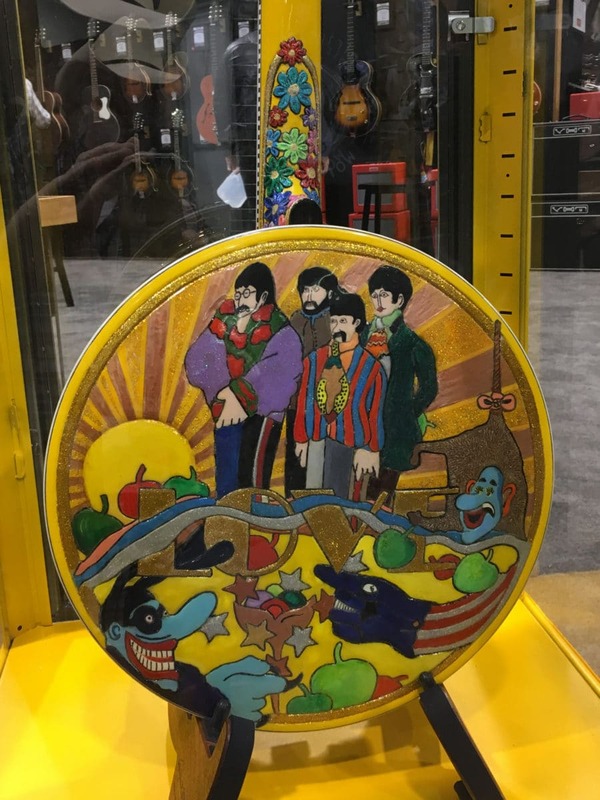 This Recording King custom banjo, a tribute to the Beatles and their Yellow Submarine, is surely such a showpiece. 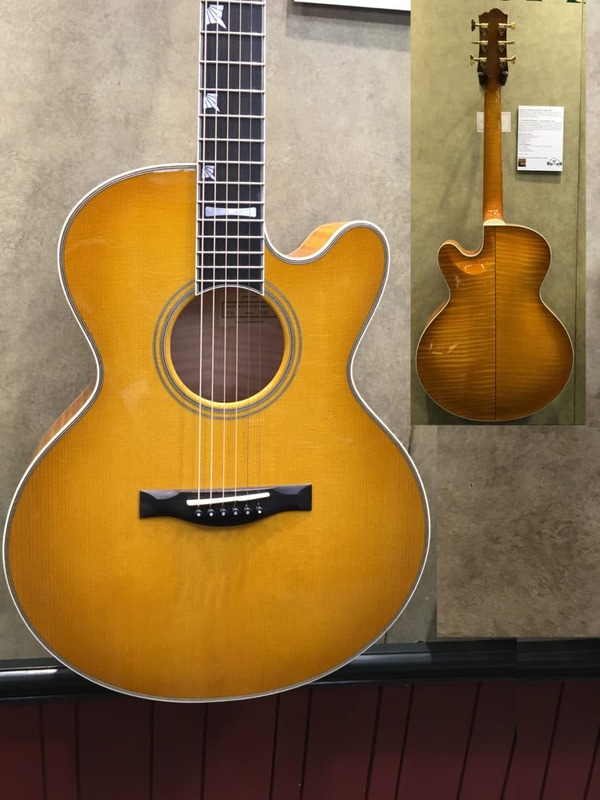 This mandocello from Goldtone is nearly the size of a guitar. 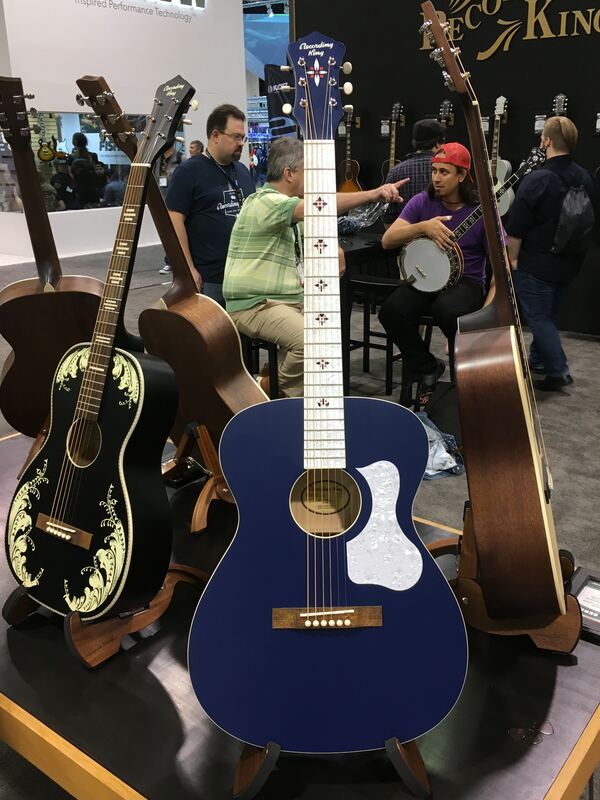 The Goldtone booth had some other fun crossover instruments including octave guitars the size of a mandolin, a dulcimer shaped like a Weissenborn Hawaiian guitar, and a bass banjo. 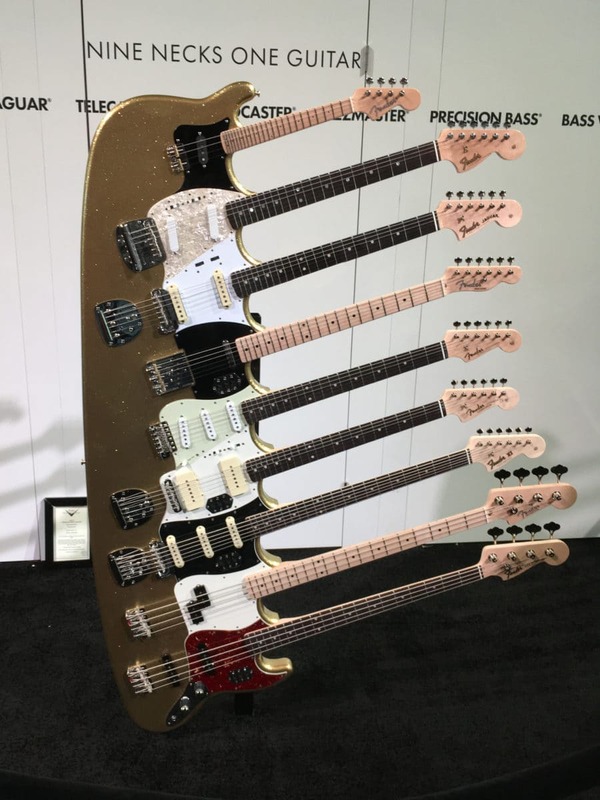 The nine neck custom Fender guitar (well…mandolin, guitar, baritone, bass) showpiece makes up in popularity what it lacks in practicality. 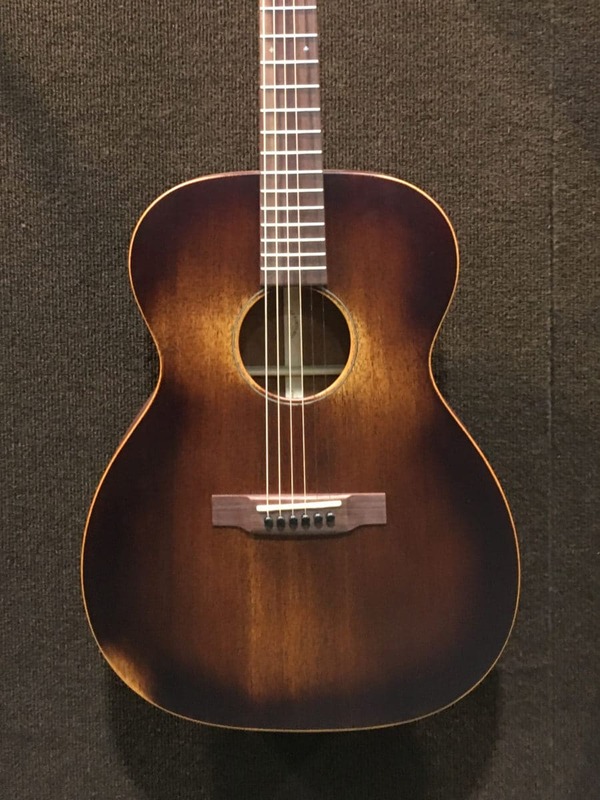 Waterloo Guitars introduced the all mahogany WL-12 MH. 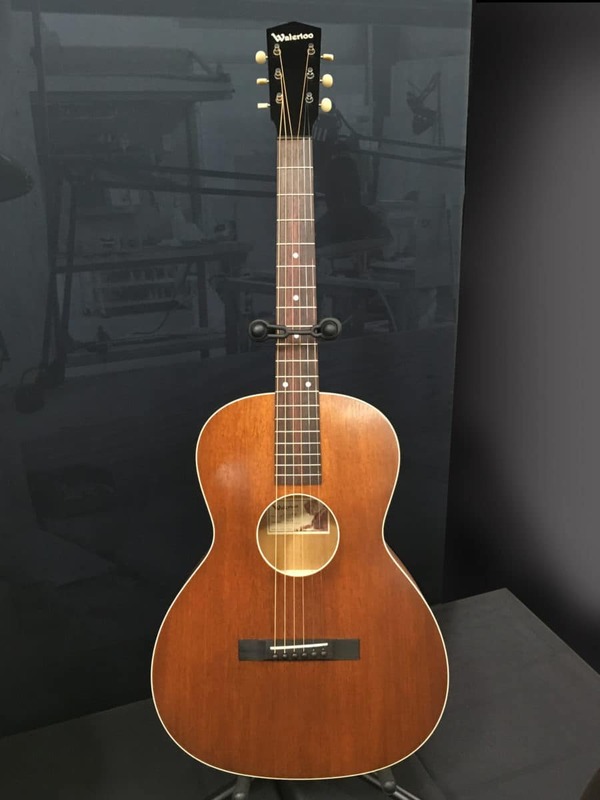 Waterloo instruments are high-quality builds inspired by the mail order guitars of the depression era. 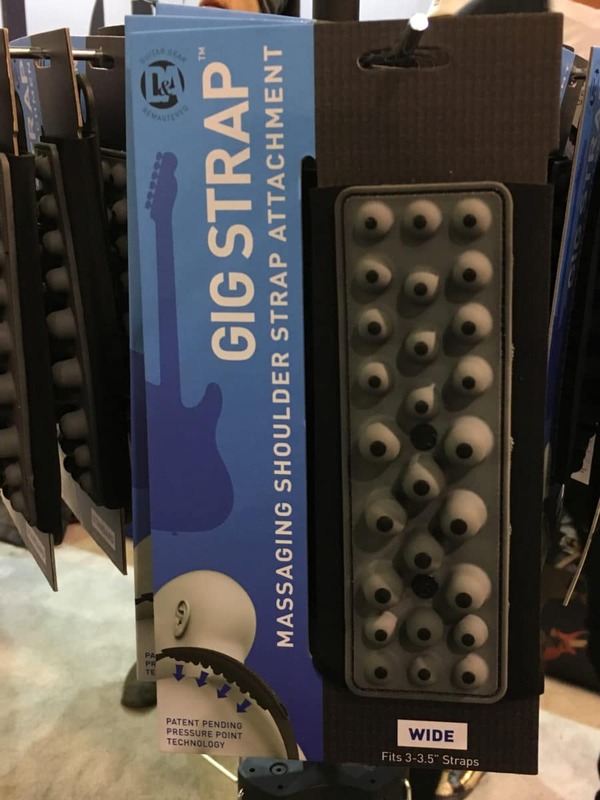 The D & A Gig Strap is an attachment for your guitar or bass strap that has rubber nubs to massage your shoulder during those long gigs. 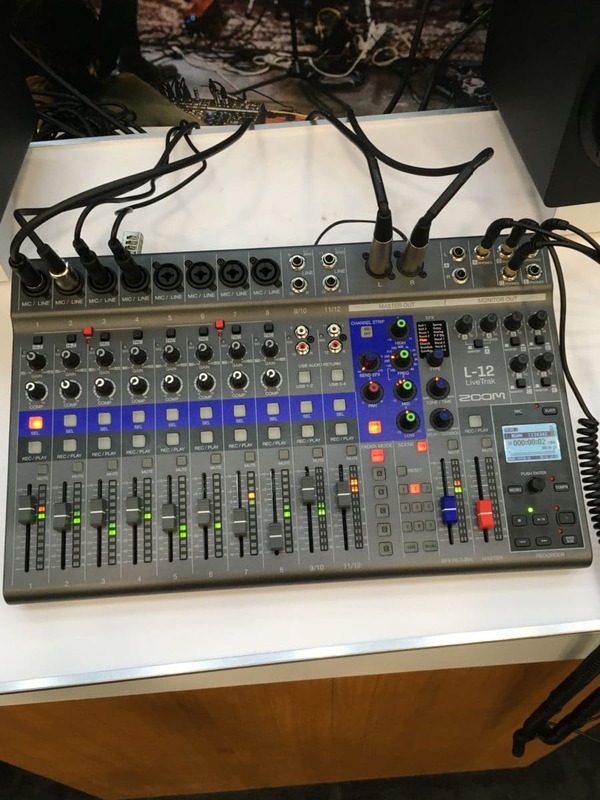 Zoom’s L-12 LiveTrak is a 12 channel Live Mixer that can also work as stand-alone recorder and a mix station for your DAW. It has 5 separate headphone mixes so each musician can track hearing what they need the most. 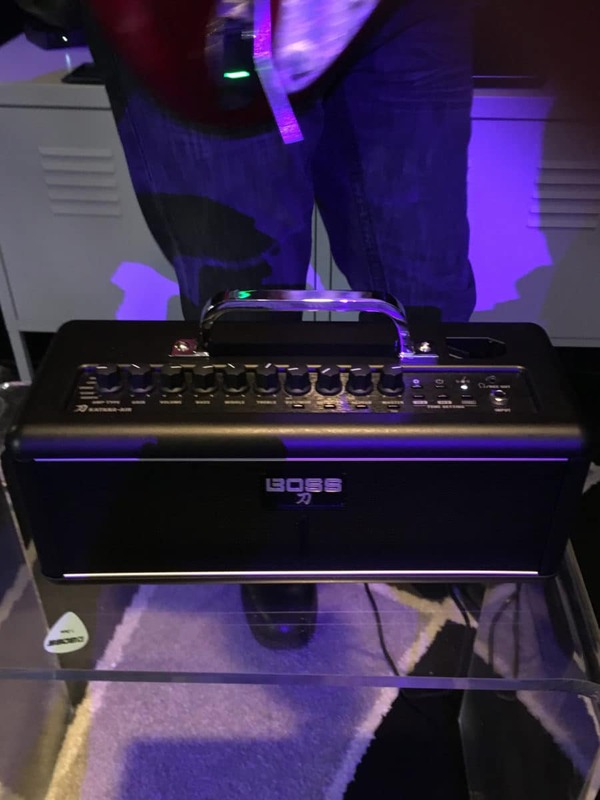 Boss showed off the Katana Air desktop guitar amplifier. The amp has a built-in charging port for it’s wireless transmitter and is loaded with features to make it the ultimate couch amplifier. It also features a USB port to function as a guitar interface for recording on a DAW. 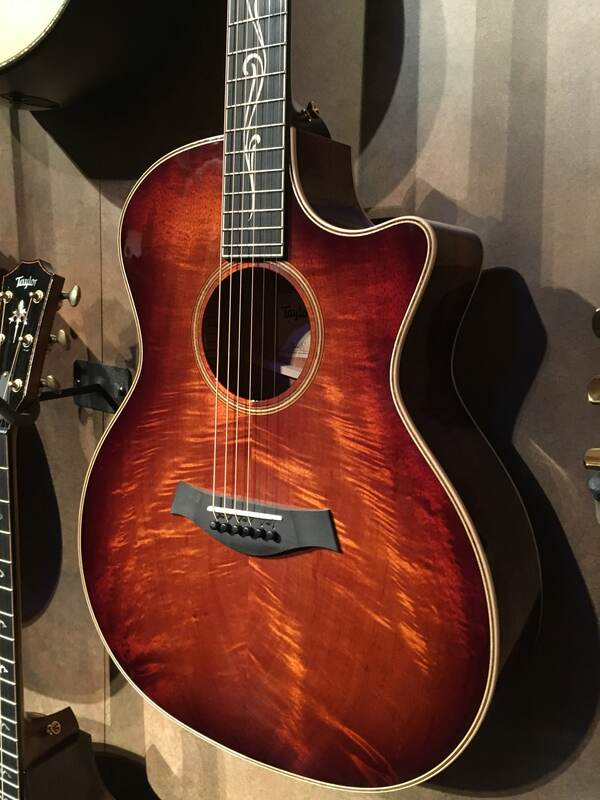 Acoustic guitarists are almost always traditionalists by nature, leaning towards natural and sunburst finishes on their instruments. This beautifully finished Model MJ by Huss & Dalton could certainly be a game changer for some…and is also available in the conventional finishes for the others.